Nightly, I moisturize my hair and seal it with oil. Then I wrap or pin my hair, covering it with a silk scarf. On Sunday, I clean my hair by co-washing (washing with conditioner) or shampooing with a moisturizing shampoo such as Nexxus Therappe. On Wednesday, I clean my hair by co-washing again. After co-washing, I deep condition my hair, rinse, apply leave-in conditioner, moisturize and seal, and place in a protective style (usually a bun). I always air-dry unless I’m away from home. Once monthly, I do a clarifying wash with ORS Aloe Shampoo. I also deep condition with a light protein conditioner such as ORS Replenishing Conditioner infused with Coconut Oil, Castor Oil, and Peppermint Oil. Afterwards, I apply leave-in conditioner, moisturize and seal, and place in a protective style. 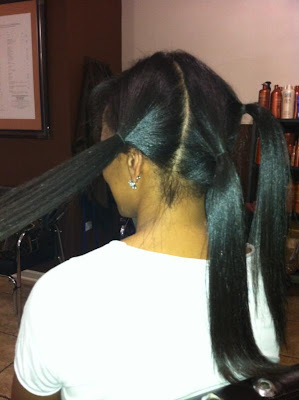 I relax by using Motions No-Lye Relaxer. Before applying neutralizer, I rinse relaxer from hair and apply a light protein to the hair such as Aphogee 2 Minute Reconstructor. This replenishes the protein I lost from the relaxing process. I let it stay on for 5 minutes, then continue with the neutralizing and deep conditioning process. Afterwards, I apply a leave-in conditioner, moisturize and seal, and place hair in a protective style. What is your current hair care regimen? If you have posts on your blog concerning your hair care regimen, please feel free to share them in the comments! For more information about creating a hair care regimen, please read The Science of Black Hair by Audrey Sivasothy and visit the website here.